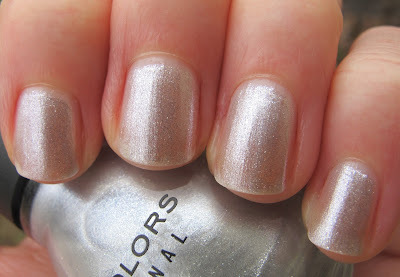 Continuing with my review of the SinfulColors Holiday 2011 Wish collection, today I have SinfulColors Out of This World. In the bottle, Out of This World looks decidedly silver, but on the nail it is a bit of a mixture between silver and white. 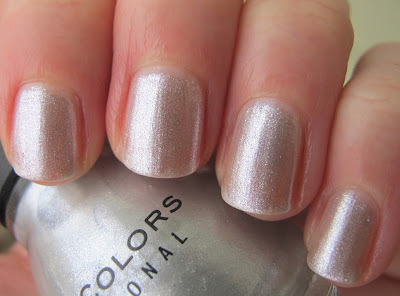 This was a good polish to include in a winter/holiday collection, as it reminds me of rain/snow and wintry skies. Out of This World is definitely a pretty sparkling white/silver. I guess I would call it very pale silver. The finish is almost like glass fleck, but a bit less dense than most glass fleck polish. This was not the most pigmented polish of the collection. I did four coats for these pictures, and there is still a bit of VNL. It applied very evenly though, no bald spots or patchiness. I think one thin coat of this would be a pretty topper for a navy or black polish too. If you're looking for an ultra-pale silver, or a pretty glass fleck-like topper, Out of This World is for you! Those looking for a pigmented silver polish may want to keep looking though. This polish was sent to me for review by a PR agent for SinfulColors. For more information, please read my Disclosure Policy.